Gun enthusiasts have trusted Outers Gun Care products for over 75 years. Their cleaning products are trusted by hunters, target shooters, and professionals across the country. Outers is owned by ATK, the same trusted brand that owns Federal, CCI, and Speer which are market leaders in the ammunition field. This durable cleaning kit comes in an attractive aged oak box that will make a perfect complement to your gun collection. This cleaning kit covers a wide range of firearm calibers with its 28 pieces. Cleaning your gun regularly and keeping it lubricated will help maintain the value and workability of your gun for years and Outers will help you do just that! The box this came in was great. Everything in the kit looks really good and was well placed. For the price this is an awesome kit. I really liked it and so did my father in law. Once again LuckyGunner was great to work with. Nice and simple and organized. The perfect kit to carry with you to the range or leave at home. My guns are clean and bright, and accurate. The Cleaning Kit helps my "Gun Control"
Lacks 30 cal cleaning rods....Only 22 cal cleaning rods provided. It is a good value but, the 22 cal cleaning rods lack a little for durability when cleaning 30 cal rifles. Just exactly what I ordered at the price I was quoted. 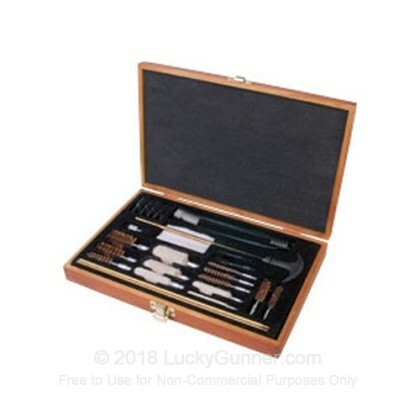 Great cleaning kit in a nice durable wooden box that even looks great at the range! A very good deal. Have always received great and timely service from lucky gunner. Thanks again! Great product and excellent value. Fit all of gun cleaning needs from pistols, rifle to shotguns. This is a great value for the price. It has everything needed to clean all my weapons. Thanks again LG. Excellent all around cleaning kit. Bought as a backup to my already extensive cleaning supplies. Many little odds and ends in here that can be used for your firearms. Overall, the cost is a lot cheaper than piecing these out individually. Fits nicely anywhere you need it for a complete comprehensive kit for field cleanings. A great small combination caliber cleaning kit. Priced just right! Easy to take with one on trips and a great self storage container.